The noise from combat models is not only exhaust noise. Propeller noise, noise from the intake, mechanical noise from the engine and vibrations in the model will also generate a lot of noise. To find the relation between the exhaust noise and all the other types of "non exhaust" noise an experiment was made with a silencer with a very high effectiveness. 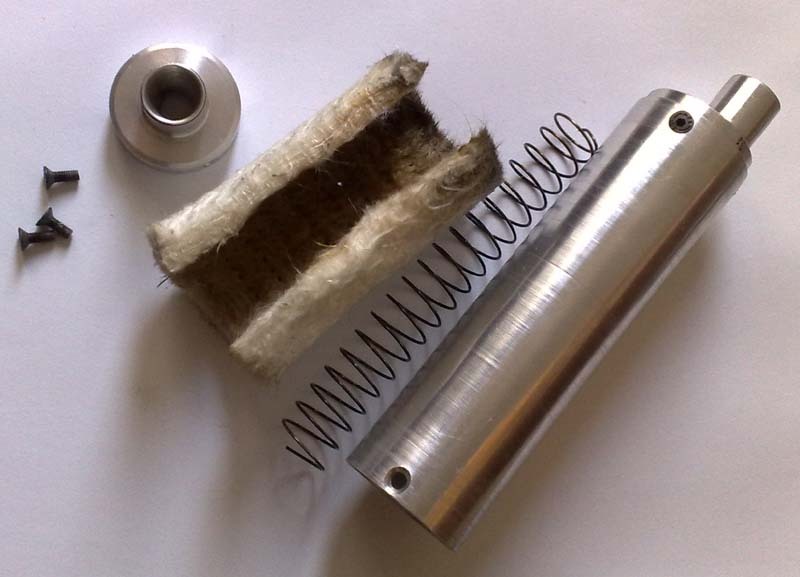 This "Super Silencer" is a big single chamber silencer with a ceramic absorber. 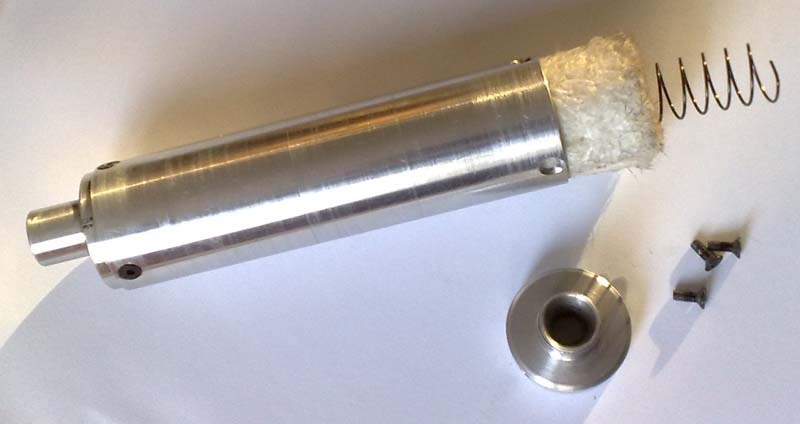 This silencer was measured to reduce the noise by 23 dB when tested on the acoustic noise generator. One of the big problems when measuring noise from combat models is that the noise level will change with the engine speed. 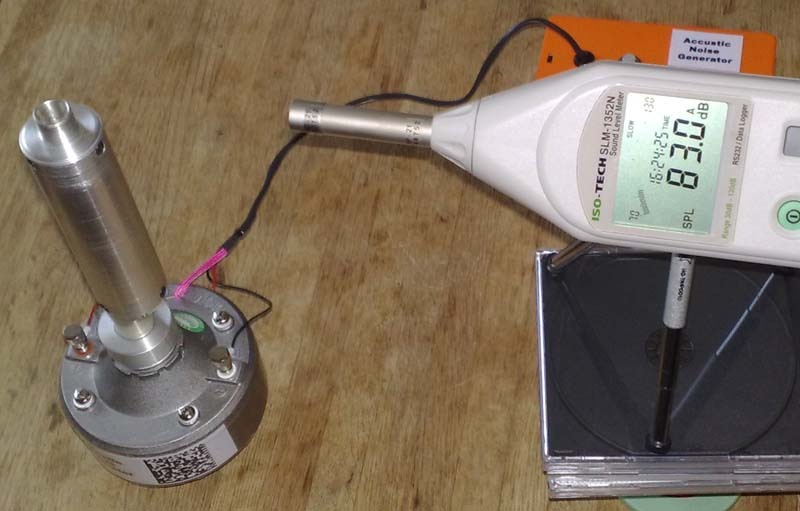 From this test and other similar tests it seems that the noise level rises with 1 dB when the engine speed on the ground increase speed by 500 rpm. To eliminate this effect we try to make measurements at the same engine speed but combat engines tend not to run stable when they are not adjusted to top speed. All noise measurements were made at the inboard wing one meter from exhaust. First we see that the Standard FORA muffler reduces the noise by 2 dB when compared to the free exhaust. The noise level with the "Super Silencer" is 3 dB lower than the noise level with the FORA muffler. If we use the 1 dB/500 rpm we can estimate that the noise level for the "Super Silencer" at 28,500 rpm would be 111 dB. The difference between the free exhaust and the "Super Silencer" will then be 5 dB. 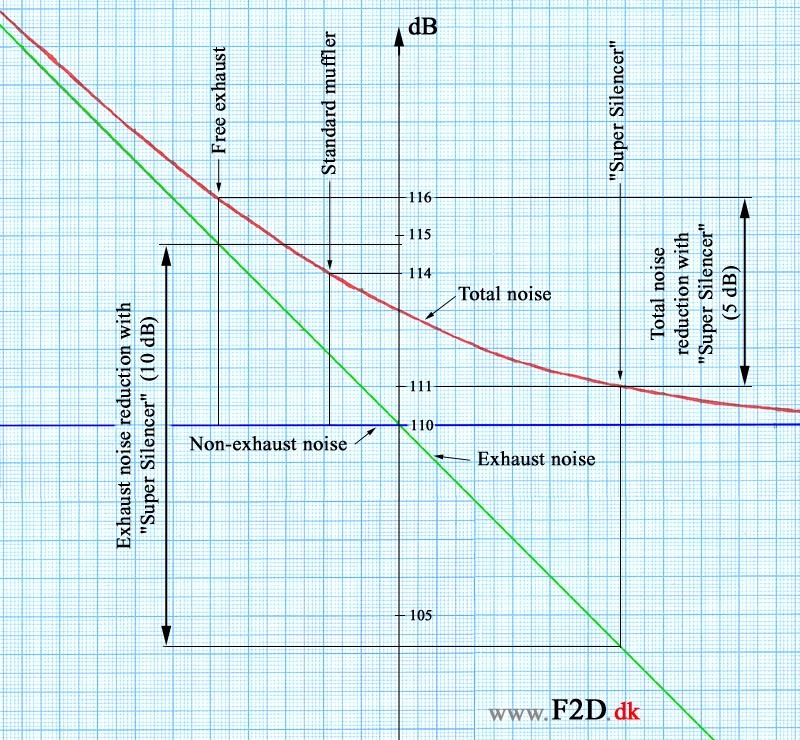 If we assume that the "Super Silencer" will remove most of the exhaust noise the "non-exhaust" noise must be just a little lower than the total noise level with the Super Silencer"
If we set the "non-exhaust" noise to be 110 dB the "exhaust" noise must then be 114.4 dB when the engine is running with a free exhaust. The combination of 110 dB and 114.8 dB will give just the 116 dB measured. With the "Super Silencer" we still have the 110 dB "non-exhaust" noise but the total noise will now be 111 dB. In this situation the noise from the exhaust must be 104.15 dB. 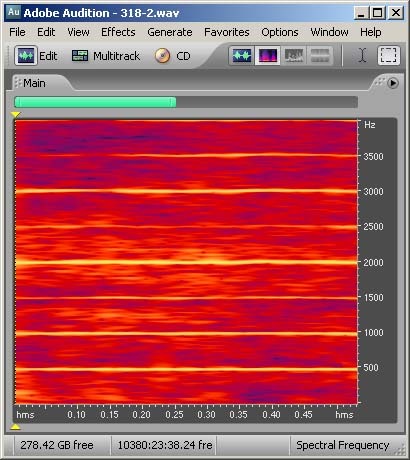 The combination of 110 dB and 104.15 dB will just the 111 dB. The real effectiveness of the "Super Silencer" would be around 10 dB (from 114.4 dB at free exhaust down to 104.15 dB). Inspired by Rob Metkemeijer's report on F2C noise the next challenge was to measure the noise from the center circle. This would represent a truer flying situation and would also eliminate the extra noise from a propeller. 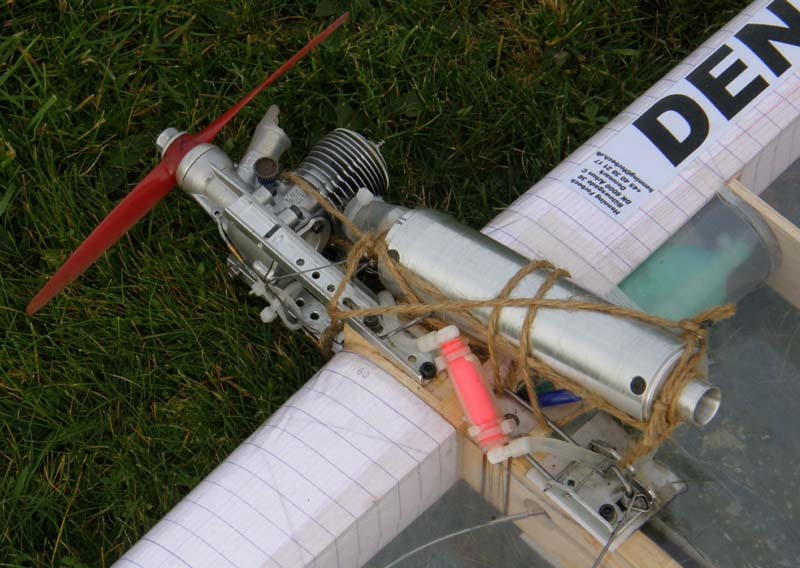 When a propeller is running on the ground it is very ineffective and therefore noisy. The Super Silencer was not designed for flying tests and could only be fitted on an ordinary F2D model with a set of very long engine mounts. A series of flights with the Super Silencer, an ordinary ø8 mm muffler and with a free exhaust was made to measure the sound level. 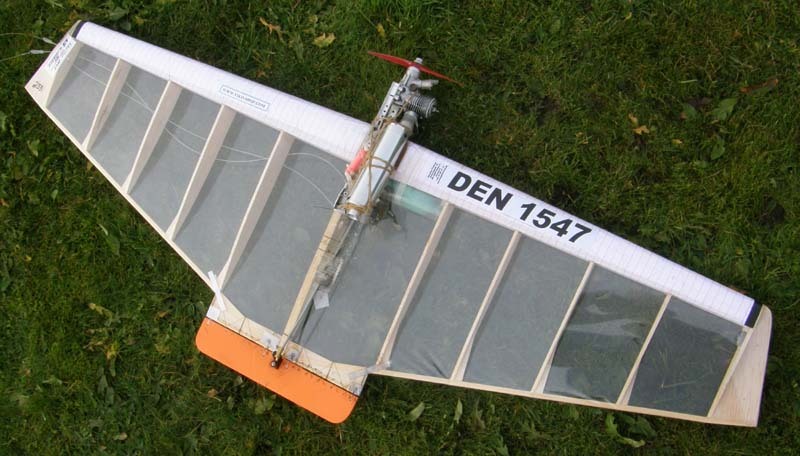 The model was flown in 5 m height and the sound level meter was held by the pilot at the same distance and height as the handle. 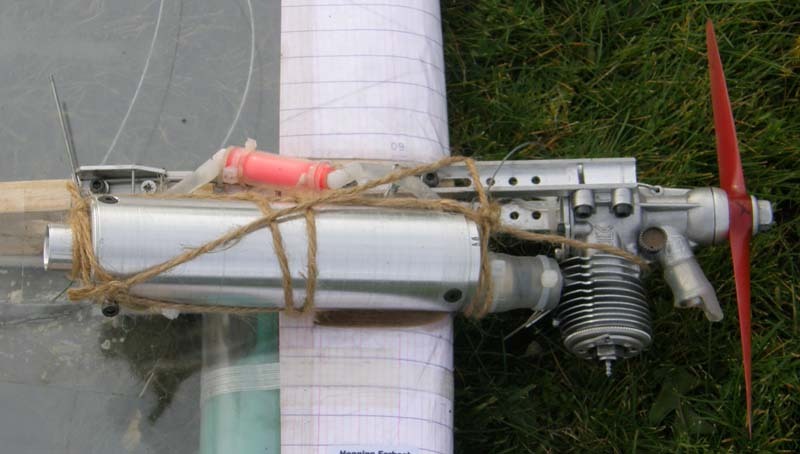 The data logger in the meter was used to store measurements during the flight and the actual engine speed was found from a frequency analysis of the video recordings. Since the engine speed does have a high influence on the noise level the Super Silencer was flown with two different propeller diameters (ø164 and ø160 mm Seryogin props). This is 3 dB more than indicated by the static test on the ground! We can now compare the results from the model on the ground with the results from the flying model. The noise level we measure for the standard 8 mm muffler is 104.1 dB. This is 2.6 dB higher than the 101.5 dB Rob found in Hungary. I'm sure all Rob's measurements in Hungary are more representative for Combat than our few measurements on a single model. If our measurement for the high effective silencer also was 2.6 dB too high the real value should be 96.1 dB. This is very close to CIAM's general level (96 dB @ 3 meter). It seems that we can meet the required noise reduction by just using very effective silencers. We will not have to make any new restrictions on propellers, engine speed or venturi size.